The Byron Hamburgers “sting” was no one-off. 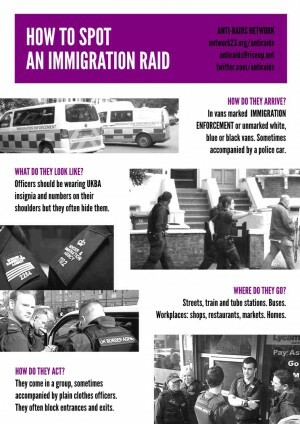 This report, analysing leaked Home Office documents, shows how the 6,000 workplace raids a year rely on “low grade” public informing, employers collaborating to target workers, and Immigration Officers acting without legal warrants. In July 2016 restaurant chain Byron Hamburgers caused an outcry after setting up a “sting operation” with Home Office Immigration Enforcement to arrest its own workers. But, as this report shows, this was no one-off. Such operations are part of standard practice in the Home Office’s campaign of around 6,000 workplace raids a year, which is routinely based on “low grade” public informing, employers reporting on workers, and Immigration Officers acting without legal warrants. The bulk of initial intelligence comes from around 50,000 “allegations” per year from “members of the public”. Most tip-offs that actually lead to raids are classed as low grade “uncorroborated” information from “untested sources”. 12 times more men than women are arrested in workplace raids; people from Pakistan, Bangladesh and India make up 75% of those arrested. Restaurants and takeaways are the main types of businesses hit. 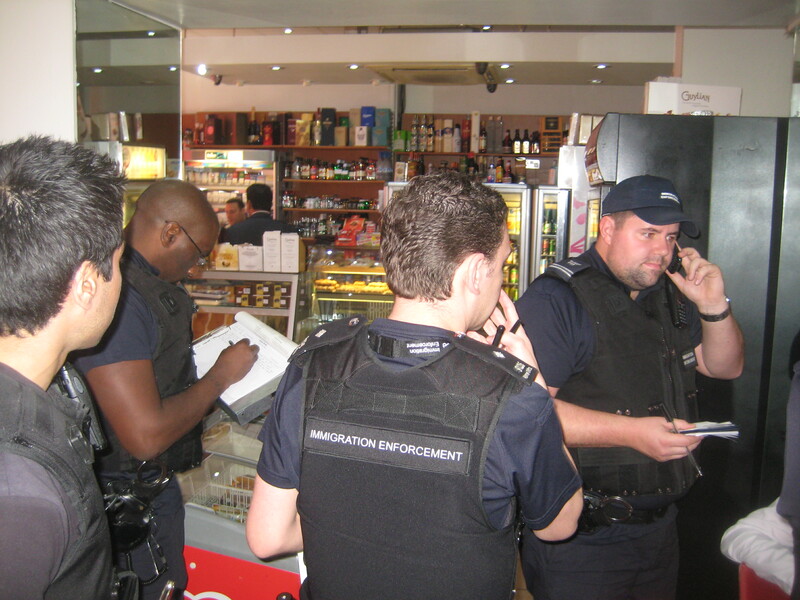 Immigration Officers seek to follow up tip-offs by contacting employers and asking them to collaborate ahead of raids. This collaboration may include: handing over staff lists; handing over personal details including home addresses, which are then raided; helping arrange “arrests by appointment”, as in Byron’s case and also mentioned in the leaked “Operation Centurion” files. Besides Byron, high profile cases of employer-supported raids have included cleaning contractors Amey and ISS (working for SOAS university), and food delivery service Deliveroo in June 2016. In these three cases, raids occurred while companies were involved in disputes with workers and unions. In general, employers are not legally obliged to co-operate in these ways: they can give or withhold “consent”. However, in practice, businesses complain that Immigration Officers often do not give the impression that co-operation is voluntary. The main pressure for co-operation is not legal but financial. Businesses are liable for a civil penalty of up to £20,000 per illegal worker found – although only if it was “readily apparent” that workers had no “right to work”, e.g., their documents were obviously fake. But this can be reduced by £5,000 for general “co-operation”, plus another £5,000 for “reporting” workers. A December 2015 report by the Independent Chief Inspector of Borders and Immigration found that officers had warrants in only 43% of raids. In most cases, they claim that business managers grant “informed consent” to enter – but there is no documentation to support this. Officers also claim that they act with “consent” in routinely rounding up andquestioning people who are not named suspects. But the Chief Inspector found: “in the 184 files we sampled there was no record of anyone being ‘invited’ to answer ‘consensual questions’”. A PDF version of this report is available to download. entry and interrogation without warrants: over 50% of raids are not sanctioned by court warrants; instead immigration officers can avoid scrutiny by claiming that businesses give so-called “consent” on the door. Reading the Operation Centurion files alongside other sources – including reports by the Independent Chief Inspector of Borders and Immigration (ICIBI), replies to Freedom of Information (FOI) requests, and communication from members of the Anti Raids Network[iv] about their experiences and those of businesses and workers they are in touch with – we can get a good picture of the system as whole. We can see how it is based on informing, employer collaboration, and intimidation of both bosses and workers during raids in ways that go well beyond the Home Office’s official guidance – or indeed, in some cases, the law. We can also see that, as senior Home Office managers are themselves well aware, this system of suspicion and intimidation has no actual hope of “ending illegal working”. But it works very well at creating a climate of fear and division, which serves politicians to mobilise racist panic and employers to exploit workers. 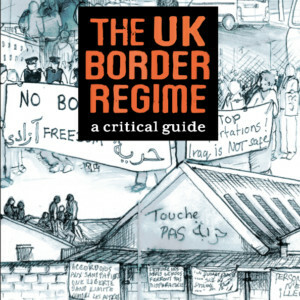 In the UK, border and migration control is overseen by one government ministry, the Home Office. Its internal workings went through restructuring in 2012-13 in which the old “UK Border Agency” (UKBA) was abolished and replaced by three “directorates”. These are: Border Force (BF), which deals with external frontiers; UK Visas and Immigration (UKVI), which deals with legal migration routes including issuing visas; and Immigration Enforcement (IE), which polices migrants within the territory. We will also encounter the local Operational Intelligence Teams (OIUs) that work with them, and their Field Intelligence Officers (FIOs). These intel officers are technically part of the Immigration Intelligence (II) division, which also includes strategic intelligence teams at national and regional levels. [vi] Also relevant are the Crime and Financial Investigation teams (CFIs), which deal with more serious immigration-related crimes such as forging passports or forced human trafficking;[vii] and the Civil Penalty Compliance Team (CPCT), which issues financial penalties to employers found breaking immigration rules. The ICE teams carry out various kinds of operations, e.g., breaking up “sham marriages”; raiding “Houses of Multiple Occupation”; or tracking down and arresting individual asylum seekers, people who have “overstayed” their visas, and other individuals identified as targets to be detained and deported. They have also run high visibility “street stop” operations questioning passers-by on busy streets or outside stations; street-based “crime reduction operations” (CROPs) targeting neighbourhoods alongside police; or, e.g., operations on public transport in collaboration with ticket inspections. However, street immigration enforcement operations appear to have decreased in the last few years. One reason may be that they provoke public outcry and resistance being blatant cases of “fishing expeditions” based on racial profiling. Like the police and other law enforcement agencies, Immigration Enforcement aims to present itself as “intelligence led”. [viii]i It claims that its operations target named individual “immigration offenders” previously identified by specific intelligence. This is clearly not the case with street stops, nor in many workplace raids either, as we will see. Currently, “illegal working” operations are a mainstay of IE activity. [ix] However, we might expect to see some new kinds of operations in the future, as immigration controls extend into ever broader areas of everyday life. For example, the new “Right to Rent” introduced in the 2014 Immigration Act requires landlords to check documents of prospective tenants. It could be that this will lead to an increase on residential raids – e.g., with ICE teams sourcing “illegal renters’” details from letting agents in the same way they approach recruitment agencies for “illegal workers’” home addresses. Before looking at the leaked Operation Centurion documents, we can get a useful overall snapshot from a December 2015 ICIBI report on “An Inspection of How the Home Office Tackles Illegal Working” (hereafter, Illegal Working 2015). [xi] According to this, the Home Office carried out a total of 36,381 “illegal working” “visits” across the UK between 2009 and 2014, or roughly 6,000 a year. In just the first nine months of 2014, for example, there were 5,414 “visits”. [xii]i From the 36,381 visits, there were 29,113 arrests. More than two thirds of visits (24,621, or 68%) don’t lead to any “illegal workers identified” or arrested, but clearly others end with multiple arrests. Some obvious facts stand out about who is arrested. First, the large majority are male: in fact twelve times more men than women were arrested between September 2012 and January 2014. Secondly, the biggest targets by far are people from South Asia. 75% of all people arrested in that period were from Bangladesh, Pakistan or India, in that order. The top ten nationalities, in full, were: Bangladesh 27%, Pakistan 27%, India 21%, China 10%, Nigeria 3%, Afghanistan 3%, Sri Lanka 3%, Nepal 2%, Vietnam 2%, Albania 2%. However, there is also a notable difference in the Op Centurion files: only 11 out of the 214 Centurion targets are restaurants. 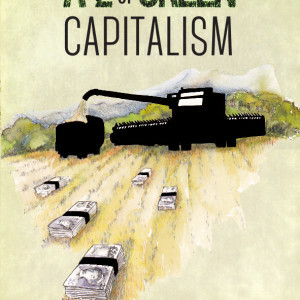 The top five sectors are construction (29), retail (20), leisure or entertainment (18), care homes (14), and manufacturing, i.e., factories and “sweatshops” (14). Then come restaurants (11), transport (11), garages (10), recruitment agencies (10), hotels (9), offices or “white collar” (9), beauty (8), security (7), food production and packaging (6), cleaning (5), markets (4), agriculture (2), logistics (1), and a charity (1). Several other intel items feature various sectors, or are not really workplace raids at all but, e.g., target rough-sleepers (1), or an individual’s home (1). One last summary statistic, this time relating to the immigration status of the arrested people – i.e., what they had “done wrong”. In the ICIBI sample, 45% were “overstayers”, i.e., people who arrived in the UK on a valid visa but then stayed after it had run out; 20% were “illegal entrants”; 13% were “working in breach” of their visa conditions: e.g., people on student visas working full time. The process is supposed to begin with an “allegation or other information regarding illegal working received by the Home Office”. This is the stage we will look at in Section 2, asking: where do these “allegations” come from? The initial lead should then be “researched and enriched” by intelligence officers, including the “Field Intelligence Officers” (FIOs) who may hit the streets to check out businesses. In Section 3, we will see how this intelligence stage often involves approaching employers, and perhaps putting pressure on them to collaborate in targeting workers in different ways. The intelligence officers then present an “intelligence package” detailing the case to the local team’s “Tasking and Coordination Group” (TCG). It is this meeting that decides whether or not to go ahead with a raid. The Tasking Group schedules the operation and assigns it to a lead “Officer in Charge” (OIC). The team should now go to a magistrate’s court for a warrant to raid the premises, or alternatively apply for an “Assistant Director’s letter” (see Section 4). As we will see, this stage is very often skipped or carried out improperly. Of course, for many people involved, the raid is not the end of the process but just the beginning. According to the general IE statistics for 2009-2014, half of all the people arrested in those five years (14,493, so 50%) were eventually “removed” from the country. Many of those, in the process, spent weeks or months languishing in immigration detention centres. The majority were forcibly deported, handcuffed and “escorted” by private security guards. Though some were allowed to “voluntarily remove” themselves, i.e., take themselves to the airport – an outcome the Home Office is keen to increase as it saves a lot of money. 2. Allegations: where does “intelligence” come from? Debates around immigration raids have sometimes focused on the issue of “racial profiling” vs. so-called “intelligence led” operations. In the wake of the Operation Centurion leak, Labour politician Keith Vaz, as chair of the House of Commons Home Affairs committee, appeared on TV to condemn the way raids appeared to be “fishing expeditions” for particular national groups, rather than being truly “intelligence led”. [xviii]i And yet there certainly is “intelligence” behind the raids. The Operation Centurion files give a very handy glimpse into how Immigration Enforcement gathers and processes “information flows”, and so finds its victims. An obvious but key point: there is no way ICE teams can possibly hope to “visit” every business where “illegal workers” might be found. They carry out about 6,000 workforce “visits” a year, ultimately just a tiny sample. But this sample is certainly not selected at random. Managers may hope to direct their teams to targets which will “bag” big arrests. Or maybe, teams will prioritise easy options, like high street restaurants, which don’t need any careful reconnaissance or preparation. Even in this case, though, teams may not just strike the first restaurant they come to, but be led by a a more specific allegation – that is, a tip-off, someone grassing someone up. On this basis, it looks like the intelligence that “leads” Immigration Enforcement largely consists of snitching from “members of the public”, such as anonymous phone calls or web form entries. However, we need to dig further into a couple of points. 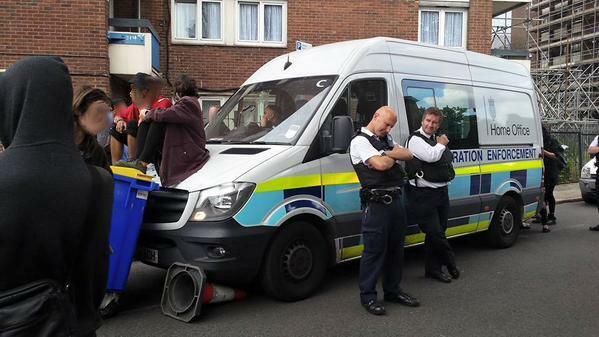 First, how much use does Immigration Enforcement make of these public tip-offs? Many are likely to be “low grade” to say the least, and it could be that Intelligence Officers use them sparingly and selectively, filtering out only the most solid intel, or preferring information passed on by the police and other agencies. Second, these figures don’t tell us what proportion of operations come from information first uncovered by IE intelligence officers acting on their own initiative, rather than responding to allegations at all. The Op Centurion files gives a few hints here. In the leaked documents, 30 entries offer some clue as to where the initial lead on a target came from. Eight mention “allegations”. For example, one entry notes an “allegation of 30 illegally working students” at a cleaning company; in an import company an “allegation has been received that they are employing persons illegally”; a manufacturing company is “alleged to be employing BRA nationals”; in a “middle tier” target “in addition to the allegations of illegal working, there are suggestions of document abuse”. Another seven cases are referrals from other agencies. Three are from the police. 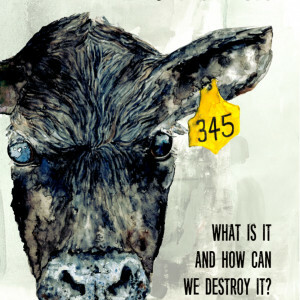 After a worker contacts the police saying they have been trafficked and forced to work at a meat-packing plant, the police contact IE requesting involvement in a joint operation. In Glasgow, an “Immigration offender [is] encountered by police at Possible House of Multiple Occupancy […] Others possibly residing there.” Elsewhere, police propose a joint op also involving trading standards “during a series of test purchases at off licenses and pubs”. Two cases involve the Security Industry Authority (SIA), which licenses security guards. In one, the SIA passes on a lead on a large security company in Luton; in another, ICE are planning to actually “attend an SIA test and check status of candidates”. Five cases are in fact repeat visits to old targets, including two to firms that haven’t paid old penalties, while another mentions “previous excellent results from enforcement visit”. Two other cases dig up unspecified “old intel”. In two cases, Immigration Enforcement has approached a company to provide information on its cleaning contractors, which then become targets. If this sample is anything to go by, many ops do seem to start with some kind of tip-off. There is just one mention in the documents of a team “cold calling” to do speculative intelligence gathering, in this case around hotels in Wandsworth, South London. Although there is another reference to “markets being scoped/developed”, which might involve teams starting from scratch in a targeted area. This picture is also supported by the ICIBI report on Illegal Working from December 2015. Here the inspector looks at a sample of 184 cases, which are evaluated according to the National Intelligence Model (NIM) “5x5x5” rating system – a standard model used by the police and other UK law enforcement agencies. 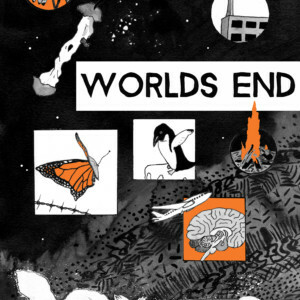 In this system a piece of information is classified on three scales: the source is rated from A (always reliable) to E (untested); the particular information is evaluated from 1 (known to be true) to 5 (suspected to be false); and another scale from 1 to 5 indicates who can have access to the information. In 127 cases, information is said to come from rated “sources”. But one fact leaps out: 98 of these are rated as E4: “untested source, information not known personally to source, and cannot be corroborated”; 19 were rated B2 “mostly reliable source, information known to source but not to officer”; one was rated B3 “Mostly reliable source, information not known personally to source, but corroborated”; eight were rated E3 “untested source, information not known personally to source, but corroborated.” In the other 57 cases the source evaluation was “not known, intelligence rating not shown or not clear in file”. In conclusion, taken together, all the evidence suggests that Immigration Enforcement “intelligence” very largely consists of uncorroborated tip-offs from unknown “members of the public”. However, we should add one last point. Immigration Enforcement has strong political, and indeed legal, reasons to represent itself as “intelligence led”, as not conducting “fishing expeditions”. For this reason, we might expect that available data under-represent operations carried out on the basis of no allegations at all. This would also hold for the Operation Centurion leaked documents. If ICE teams are regularly “cold calling” high street takeaways, this may not get written up as such even in internal case notes, and above all not for a showcase operation. However, it could be that many of the 57 cases in the ICIBI sample without any source ratings were just this kind of “speculative” operation. So our general conclusion might be: most IE intelligence comes from uncorroborated public informing; whilst some operations may not be based on any intelligence at all. How common are these kinds of operations? Unsurprisingly, official data doesn’t reveal this. The Amey and ISS cases came to light because some of the workers targeted were active trade unionists and campaigners who raised a public outcry. The case of Byron, too, was initially reported in Spanish speaking media, then raised by black activist groups on social media, and only picked up by mainstream UK press weeks later after the “#boycottbyron” hashtag went viral on twitter. We can suppose that there are more cases of this kind, which do not receive media attention. How does that square with the evidence discussed above that the bulk of information starts with “members of the public”. One possibility is that employers are also included as “members of the public” in the figures, and the bulk of the 50,000 tip-offs come straight from bosses. We cannot rule this out, as the available figures do not break down sources further into types of informants. But another possibility, which perhaps fits better with the overall picture, is this: public tip-offs, anonymous or otherwise, are often the first lead; next, Immigration Enforcement typically follows these up by approaching employers, threatening penalties if the tip-off turns out right, and demanding more specific details on “suspected illegals”. Very often, the employer agrees to turn informant. Sometimes, they also agree to more, such as helping to set up a sting. So, even if the initial informants are not employers, they then play a key role in developing these leads. Going through the Op Centurion files, 18 entries explicitly mention discussions between Immigration Enforcement and employers. The IE staff involved in these discussions may be ICE immigration officers, or intelligence staff such as “Field Intelligence Officers” (FIOs). As many of the Op Centurion files concern cases in early development, some of the references are to initial plans to “contact” or “engage” employers. The fact that contact often seems to be initiated by Immigration Enforcement supports the pattern we just sketched. For example, Midlands ICE teams plan to visit “markets and engage with managers there and do some intelligence gathering there”. In London, “contact to be made with Berkeley Homes over a large construction site in Greenwich”. In another case, “contact made with Holiday Inn […], awaiting return contact from HR”. Three of the entries that mention employer contact concern recruitment agencies. One case note reads as if possibly the initial approach came from the company: intelligence officers are planning to visit the agency after “they noticed an increase in Africans submitting ITA[lian] ID cards and [passports].” Another interesting entry refers to a visit by FIOs to a recruitment agency where “12 offenders were identified”. It ends: “residential visits to be tasked”. That is, it seems, the agency is passing on home addresses of people on its books looking for work, so that ICE can then raid their houses. As well as passing information on workers, employers may also point the finger at other employers. Two cases are mentioned in the files: in both, Immigration Enforcement is “contacting” or “in communication” with companies – a car auction site and a cinema chain – about their cleaning contractors. Finally, we come to two entries that may indeed refer to Byron-style operations where arrests are set up “by appointment” with bosses. One from the South East team reads: “FIOs are liaising with cleaning companies with a view to arrests by appointment being made.” The other is from the South Central team: “FIO looking at a mid size warehouse […] which is owned by a Chinese national. FIO’s are still liaising with cleaning companies with a view to arrests by appointment being made.” Given the very similar wording, these two entries may indeed be talking about the same operation: apparently a large operation against a number of companies, and across at least two local ICE areas. There is one entry in the documents about an employer, or in fact an employers’ association, not cooperating. 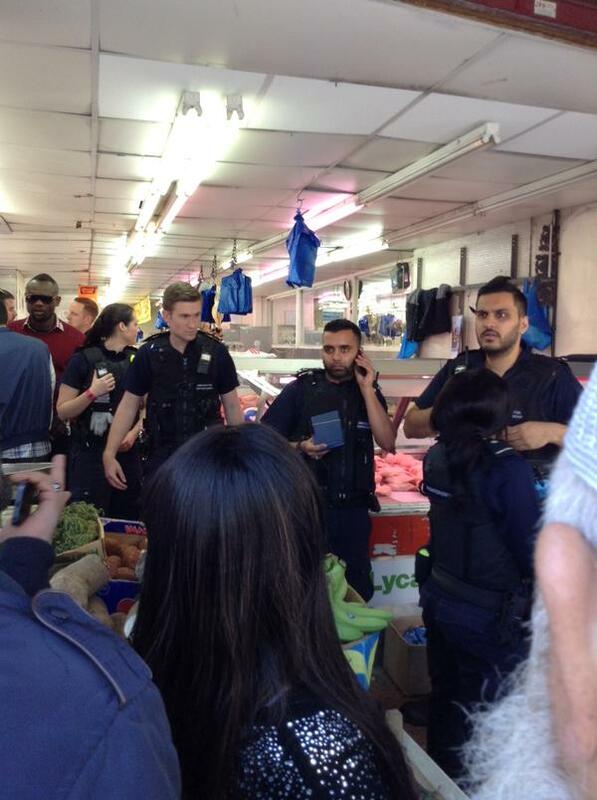 Officers contacted the association “to establish information flows however this is looking unlikely due to a reluctance to work with Immigration Enforcement”. This is the only case of non-cooperation noted in the documents. Of course, other potential cases may not have made it into the files for precisely that reason. The Op Centurion files suggest that it is very often Immigration Enforcement, acting on a prior tip-off, who initiate contact with employers. This seems to make sense: under most circumstances, why would it be in an employers’ interest to “bring down heat” on themselves? After all, one of the perks of “illegal” labour is that it’s not hard to fire workers. Under most circumstances, that is. We can also think of exceptions. For example, an employer might be unwilling to do their own dirty work of firing workers, perhaps because of social or family connections to workers. Or some employers may be keen to have help in taking on a “difficult” workforce, perhaps where workers are organising. This, of course, is exactly the situation in which Amey and ISS set their stings –and more recently, in which Deliveroo worked with police and Immigration Enforcement. It would be worth investigating further the specific use of these tactics in relation to workplace disputes. Whereas actual arrests have to be formally documented, there seems to be little recording of what happens in “educational visits” – the ICIBI report notes that “the recording of engagement with local businesses and stakeholders needed more effective management.” Nonetheless, the ICIBI reports give some ideas of standard forms of “engagement”. The most basic one is demanding to see records of employers’ “right to work” checks: the Op Skybreaker evaluation noted that half of businesses failed to show these. It’s worth pointing out here that there is no legal requirement for businesses to show “right to work” check records on demand during an “educational visit”. (In fact, as the ICIBI report notes, some police forces advise employers not to keep them on the premises.) The legal purpose of “Right to work” check records is to serve as evidence, after a raid that discovers “illegal working”, that an employer did not employ these workers knowingly or negligently, and so avoid a penalty. Clearly, however, they serve another function for Immigration Enforcement: a way to get information on workers in advance of planning a raid. Are firms forced to collaborate? This last point brings up an important question. In the Byron Hamburgers case, many of the chain’s media defenders argued that it had no legal choice but to co-operate with Immigration Enforcement in setting a trap for its workers. As we will now see, this is not the case. The choice was not legal but financial. Also, it would only need to be faced at all if Byron’s had knowingly or negligently employed “illegal workers”. It is a criminal offence to employ someone if the employer “knows or has reasonable cause to believe that the person has no right to do the work in question”.xxxiii For example, an employer could be convicted if the court finds that they “deliberately ignored information or circumstances” about the worker’s status. 30% further reduction for paying within 20 days (again, only applicable if not caught in last three years).So if this is the first offence in three years, and if the company reports its workers, co-operates fully with all further demands, and shows effective document checking, it can have all penalties waived. If it can’t show effective document checking, it can get its penalties down to £3,500 by informing, co-operating fully, and then paying promptly. An employer only faces a penalty for accepting false documents if they are obviously fake. For example, the Independent Chief Inspector specifically discusses a case where the CPCT penalty team: “considered that the identity documents provided by many of those arrested were fraudulent, but determined that this was not ‘readily apparent’ so canceled all but one civil penalty.”xxxix As the Inspector puts it,“employers are either negligent in respect of their obligations to check their employees’ ‘right to work’ or complicit in hiding such work from the authorities.”xl To pick up some of the discussion of the Byron Hamburgers’ case: the company should not have faced any penalties if it had just been “tricked” by cleverly forged documents. There is no general legal requirement for companies to hand over documents requested by Immigration Enforcement in advance of a raid. Companies may choose to do so in order to provide evidence that they have correctly applied right to work checks. This will only be relevant if Immigration Enforcement in fact finds illegal workers, and so the employer needs a statutory excuse. So, if a firm is confident that it has no illegal staff, it is within its rights to refuse to give information Immigration Enforcement. (In fact, it is within its rights to do this even if it does have illegal workers – although it won’t then be able to use a “statutory excuse” if Immigration Enforcement catches them. And probably this would not look good if a court case did result.) As we will see below, Immigration Enforcement acknowledge this fact by (at least sometimes) asking employers to sign “consent forms” authorising access to staff records. If a company does provide documents to show a statutory excuse, it only needs to provide those that are directly relevant: i.e., ID document copies, with records of the dates when these were checked. It does not have to hand over further personal information such as workers’ home addresses. But while there is no legal obligation to hand over these documents ahead of a raid, or otherwise co-operate, there are financial incentives – unless a firm is fully confident that no illegal staff will be found. In the Operation Centurion documents, 25 cases mention Immigration Enforcement working with at least one other state agency in some capacity, from sharing intelligence to full on multi-agency “joint operations”. In ten cases this includes police, including one case with the British Transport Police (BTP) relating to railway workers. HMRC is involved in four cases, the Security Industry Authority (SIA) in three, and the Department for Work and Pensions in two. Besides the police, the most common partners are various Local Authority departments. 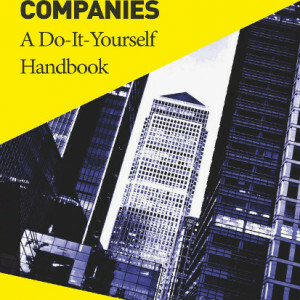 These include: environmental health and food hygiene (to coordinate joint operations against restaurant and food preparation businesses), market regulation, liquor licensing (targeting restaurants and shops), taxi licensing (intelligence gathering or joint operations against taxi firms), and planning (to gather information on large building sites). We have seen from the Operation Centurion documents a few basic forms of employer collaboration. The most common appears to be handing over “staff records”, which may sometimes include detailed personal information such as home addresses. “I am aware that I am not obliged to provide consent. I can refuse to answer any questions and ask the officers to leave at any time for any reason”. finally, the threat of being raided, in itself, may have some effect: even if no “illegals” are discovered, a raid can involve inconvenience, humiliation, and lost business. Whereas “arrests by appointment” can be arranged to minimise problems for the business, e.g., before opening hours as in Byron’s case. Anecdotally, members of the Anti Raids Network have confirmed that this is what often happens at an Immigration Enforcement “educational visit”. Intelligence officers or ICE teams call into a business, or sometimes telephone. They ask for full staff lists, and may demand further information on specific individuals. The threat, made implicitly or explicitly, is that if firms do not hand over all information requested they are likely to face a hostile raid. Non-cooperation will lead to higher penalties, and possibly criminal charges, if “illegals” are discovered. Penalties can be brought down potentially as low as zero if employers indeed “report” suspect workers. It may take a particularly confident employer to resist these pressures. Here we reach the limit of what we can learn from public or leaked Home Office documents. To research this question further, an obvious next step would be to interview employers and workers who have been subject to Home Office “educational visits”. In many vampire stories, the undead can enter a building only when invited in by the occupiers. Immigration Enforcement often work on a similar principle. In the ICIBI December 2015 report on Illegal Working operations, the Inspector looked at how raids were carried out for the sample of 184 cases. This included how ICE teams gained entry to targeted premises. In 79 cases, the teams had court warrants. In three cases, the power of entry was not clear in the records. In the large majority, 102 visits, the Immigration Officers entered without a warrant claiming that they had “informed consent” to do so. Before we look at what “informed consent” amounts to, it is worth comparing these figures with others from a previous ICIBI report which attracted some attention. In 2014, the Independent Chief Inspector published, “An inspection of the use of the power to enter business premises without a search warrant”.xlvii More specifically, this report focused on the use of a particular power granted by Section 28CA of the Immigration Act 1971, called the “AD Letter”, in which under certain circumstances Immigration Officers can legally enter a business without a search warrant if authorised by a Home Office Assistant Director (usually, the head of a local ICE team). However, this doesn’t mean that ICE teams are now following the regular channel of applying to a magistrate’s court for a warrant in most cases. In the sample in the December 2015 report, teams only had valid warrants in 43% of raids (79 cases) – an improvement on the 33% counted in the 2013 figures, but still not the norm. Instead, it appears, where teams once wielded an AD letter they will often now rely on claiming “informed consent”. Informed consent, according to Immigration Enforcement guidance, means “a person’s agreement to allow something to happen after the person has been informed of all the risks involved and the alternatives”. lii The Chief Inspector’s report further clarifies that “the guidance requires ‘fully informed’ consent in writing by a person ‘entitled to grant entry’”. How often does this happen? We can’t know for sure – but we suspect not very often. As the inspection report notes, there is not much of a paper trail on how “informed consent” was established. The records seen by the Chief Inspector “did not note specific enquiries to comply with the requirement to establish that the person consenting to entry must be ‘entitled to grant entry’. In most premises visited, English was not always the first language of those encountered.” In general: “Files rarely documented how officers confirmed that consent was ‘fully informed’ as required.” liii There seems to be no requirement for teams to keep signed consent letters on file and available for inspection. There is then no way for the genuineness of “consent” to be proved or disproved, or for the officers involved in gaining “consent” to be held to account. Moving away from AD letters to reliance on “informed consent” has in fact made ICE operations even less accountable and open to scrutiny than before. 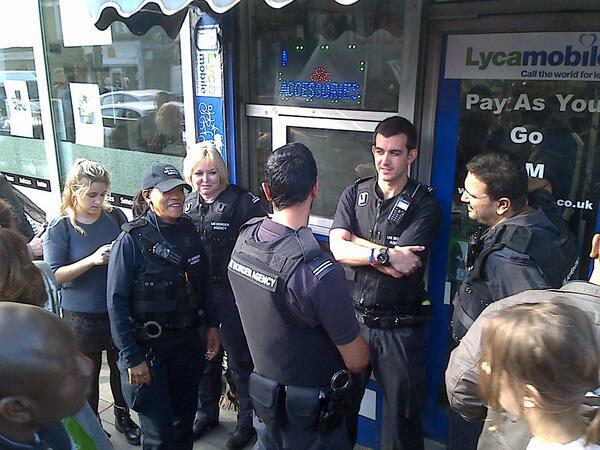 Anecdotally, we are told by the Anti Raids Network that it is very common for raids to take place in the following way: ICE officers turn up at the door and ask to speak to the manager, while other officers may already have sealed off other exits to prevent people from leaving the building; the officers then ask the manager (or an available worker) for verbal consent to enter the premises, or at best to sign a paper granting written consent on the spot. and permission may often not be sought or given in writing. I.e., although most raids do appear to be initially targeted based on some form of (low grade) “intelligence”, once inside the building they typically become a general round-up. 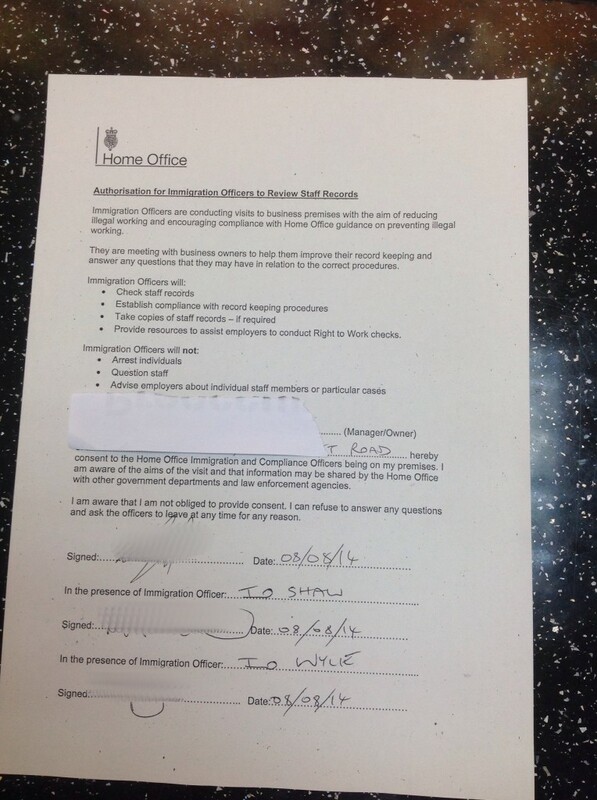 However, we can suppose there are also some occasions where Immigration Enforcement do genuinely have employers’ “informed consent” to enter premises. This was clearly the case in the sting operations set up with Amey, ISS and Byron. More generally, establishing “informed consent” may be one possible objective of pre-raid “educational visits” – although, it seems clear, ICE teams are not too bothered if in the end it is lacking. Again, the obvious way to investigate further the actual circumstances under which “consent” is claimed would be to survey employers and workers about their experiences both in raids and in pre-raid visits. Conclusion: what are raids for? It most often starts with a tip-off, an “allegation”. Or, sometimes, with a referral from police or other agencies, or maybea speculative “cold call”. Astandard next step is then to approach employers and seek their collaboration. Typically, employers are asked to hand over lists and details of workers, in order to identify “illegals” who can then be targeted at work or at their home addresses. Sometimes, this collaboration may lead to “arrests by appointment”, as in the sting operations infamously launched with cleaning contractors Amey and ISS or recently with Byron’s Hamburgers. Employers are not legally obliged to collaborate in any of these ways – though if they don’t, they may face higher financial penalties if illegal workers are found on their premises. ICE teams don’t need employers’ collaboration, and are seemingly happy to claim “informed consent” to enter, or consent to question unnamed individuals, with no justification whatsoever. But employer collaboration certainly makes their work much easier: it provides the “majority of reports about suspected illegal working”, and will increase arrest numbers both at workplaces and at workers’ homes. And yet, even with maximum co-operation, Immigration Enforcement catches only a tiny proportion of people working illegally. As we saw, each year the Home Office carries out around 6,000 workplace raids, and makes around 5,000 arrests, half of which lead to deportations. For obvious reasons, there are no reliable figures on numbers of illegal workers. 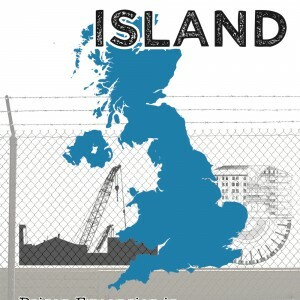 The most widely quoted research on “irregular migrant” numbers in the UK remain those from a study carried out by the London School of Economics (LSE) in 2009, which gives an estimate of 618,000, in a range of 417,000 to 863,000.lviii Not all of this number are working: the estimated figure includes underage children, the elderly, and other dependents, as well as a supposed higher proportion of unemployed adults than the norm. However, there are also other “illegal workers” who would not be counted in the LSE estimates: e.g., asylum seekers or people on student visas who are not “irregular” as residents but do not have the right to work. Any number we use would be a simple guess. But even supposing “illegal workers” to be as few as 250,000, this would mean that only around 2% are arrested in a year, and only 1% deported. Immigration Enforcement does not stop or deter those must work as a necessity, work to survive. Or work to save or send money to family and loved ones, in a world where even the sub-minimum wages paid to many “illegals” in the UK (the illegal “discount” referred to by Shahram Khosravilix) are generally far above wages in its former colonies or its warzones. But it does mean that anyone living in the world of migrants will know people who have been raided, who have been arrested, who have been detained and deported. So the reality and the fear of Immigration Enforcement seeps into life every day, to be always a shadow cast around the corner. Immigration Enforcement does not stop people working illegally – but it makes them work fearfully. Immigration Enforcement helps maintain a segregated “two tier workforce” in which hundreds of thousands of workers have no access to the rights or safeguards available to other workers. The fear of Immigration Enforcement keeps workers in the lower tier scattered, unseen and unheard. The threat of Immigration Enforcement provides the ultimate human resources tool to stop workers becoming “difficult” and organising to demand improved rights or conditions – as seen in the cases of Amey or ISS. This is not an issue just of a peripheral minority. Illegal working is at the heart of the economy. Illegal workers are not just in the restaurants or street markets that make easy and symbolic targets for ICE raids. They are the base level of the driving sectors of the UK economy: building workers, office cleaners, food pickers and packers, warehouse lifters, drivers and couriers, the menials in every service industry. The “discount” on illegal workers makes a fundamental contribution to every business model. Every blue chip company relies on illegal labour. Which is not, for them, illegal – so long as these workers are not directly employed. Only the base level contractors or sub-contractors who immediately hire cleaners or labourers are liable for “right to work checks” and penalties.lx As we saw, one Immigration Enforcement tactic is to approach higher tier companies for information on contractors. Raids are, usually, kept at base level leaving the “respectable” companies unscathed. To summarise, we can say that Immigration Enforcement does not work to end illegality, but it does work to maintain it in a segregated “lower tier”. The main way it does this is by spreading fear and division. Raids are exemplary punishments – propaganda tools. Furthermore, the propaganda of Immigration Enforcement has a double focus. On the one hand, it targets illegals. On the other, it targets the legal population. 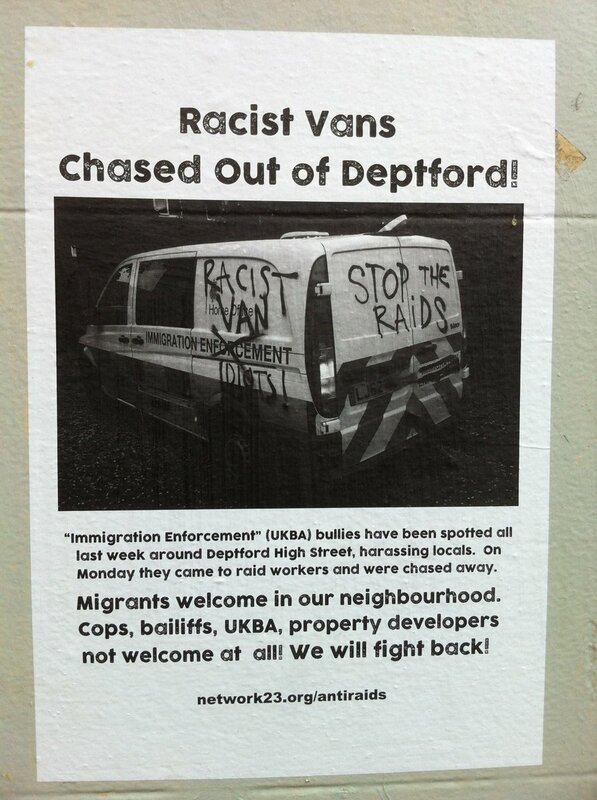 Hence the press releases, high-profile operations, tabloid exclusives, camera crews invited on raids, and former initiatives such as the “racist van” billboardslxi and “UK Border Force” TV showlxii, etc. – the spectacle of enforcement. The illegals should fear Immigration Enforcement; the legals should fear the illegals, as they fear for their jobs, their homes, their “way of life”. Home Office managers know that they will “never have the resources to resolve the overall problem”.Conscientious officials may well yearn to resolve the problem, whilst privately admitting that they best they can hope for is to achieve a few minor efficiency gains. But while the “problem” continues, business profitsfrom scared and discounted labour, and politicians and journalists make careers being tough on immigration. iii The Operation Centurion files have not been published themselves because they contain personal information naming businesses and sometimes individuals. In this report we quote from the files and anonymise where necessary. iv In writing this report we have benefited greatly from the advice and assistance of members of the Anti Raids Network. 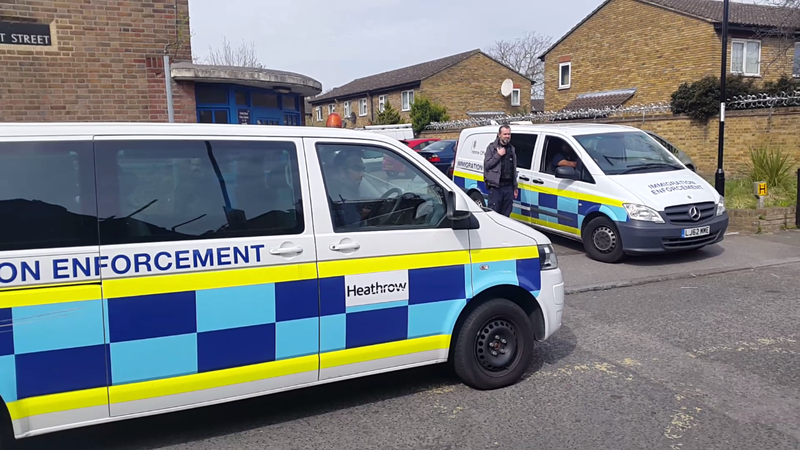 This network has been actively campaigning against immigration raids in London since 2012, in which time people involved have not only helped resist many raids but have amassed a wealth of information. See the network’s website https://network23.org/antiraids We also thank Anti Raids Network for the use of images from their website. v Some detail on the grades of Immigration Officers and their training can be found in the Independent Chief Inspector of Borders and Immigration (ICIBI) report on “An Inspection of How the Home Office Tackles Illegal Working”, para 6.8. http://icinspector.independent.gov.uk/wp-content/uploads/2015/12/ICIBI-Report-on-illegal-working-17.12.2015.pdf Hereafter, we will refer to this report as “ICIBI Illegal Working 2015”. vi There are four regional intelligence teams, their official title is “Receipt, Evaluation and Development” (RED) teams. vii A basic point to note is that the majority of “immigration offences” are not in fact “criminal offences” – although this may be changing, as Government moves to criminalise “illegal immigration” with legislation including the Immigration Act 2016 that now makes “illegal working” a criminal offence. ix We don’t currently have data on the proportion of raids that target illegal working. But, also, bare numbers of raids wouldn’t really give a full picture, as workplace raids may vary from small corner shops to major ops on big factories, or big employers working across a number of ICE team areas. NB:These two sets of figures appear to contradict each other: the number released to Kleinfeld for 2014 visits is less than half that given in response to the earlier request. This does not seem to be because of the “raids”/”visits” terminology: in fact the official term used in the responses to Kleinfeld is “raids/visits”. One factor may be that Kleinfeld’s figures only cover the main London postcodes (N, NW, E, SE, SW, W), and not outer London areas with other postcodes – but this seems unlikely to explain all of the discrepancy. The Home Office also has been using a system called ATHENA , provided by Serco, to record staff intel. This was due to be switched off and replaced in May 2016. IE intelligence officers also have access to various other internal or cross-agency computer systems and are supposed to use these to cross-check intelligence on targets. These include the following: CID; CRS (Case Reference System – a HO database containing details of all visa applications); Experian – commercial database holding credit reference information and personal information held by financial institutions; Warnings Index – a HO System used to ascertain whether individuals are of interest to the Home Office; Home Office National Operations Database; Police National Computer – https://www.gov.uk/government/uploads/system/uploads/attachment_data/file/488515/PNC_v5.0_EXT_clean.pdf.. Source: ICIBI Intelligence 2016.
xxxii We note here that there is a good deal of ambiguity surrounding the law around raids, which makes it hard to state definitively what is or is not legally required. In particular, much of the relevant immigration law has never been tested in court – in part because those targeted in raids often disappear into detention or may indeed be deported. Also, some of the relevant legislation is very new, including the 2016 Immigration Act. Much of our account here sticks conservatively to Home Office internal guidance. But this is itself just an interpretation of the law and open to challenge in the courts. xli For example, the ICIBI IllegalWorking 2015 report (para 4.20) mentions one such scheme called “Better Business Compliance Partnerships ”. “In October 2014, the Cabinet Office launched Better Business Compliance Partnerships. Pilots in five locations (Cheshire West and Cheshire, Cornwall, Hertfordshire, Ealing, and Manchester and Salford) aimed to improve compliance with business regulations by encouraging front-line regulatory staff to share observations outside their own powers. For example, IE might encounter sub-standard accommodation or food hygiene inspectors might identify suspected illegal workers. xlvii http://icinspector.independent.gov.uk/wp-content/uploads/2014/03/AD-letters-report-Final-Version-for-Web.pdf Herafter ICIBI AD Letters 2014.
xlviii ICIBI AD Letters 2014 page 20 figure 8. NB: the figures in this report unfortunately do not show the proportion in which “informed consent” was claimed. lvI CIBI Illegal Working 2015 para 5.27 Another legal justification for questioning someone could be that their immigration status is perceived as dependent on that of someone initially under suspicion, e,g., a spouse or other family member.